The Pink Lady: a Catskill Legend. The ca 1900 dry fly & cocktail. 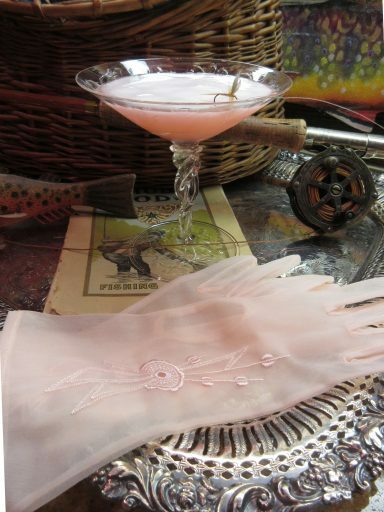 Ever wonder how a historic dry fly & vintage cocktail can become entwined because of history? It was a pleasure to research and write an article for the new woman’s fly fishing publication DUN Magazine, therefore – read on about these famous sisters from different misters! Featured photo shows my grandfather’s ca 1940 Wright & McGill bamboo rod & reel. A 1903 fly fishing catalog and my mother in laws beautiful pink gloves. The Pink Lady fly is tied by Dave Brandt of Oneonta, NY.